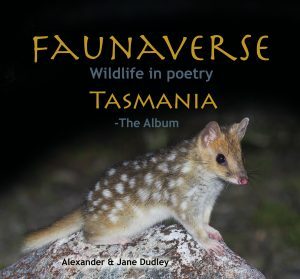 Faunaverse Wildlife in poetry Tasmania can now be enjoyed as an Audiobook/Album! The Album contains all 25 poems narrated by Alex or Jane and 5 of the poems reinvented as awesome catchy songs! You can now listen to Faunaverse on your MP3 in the car, at home or in your ears whilst exploring the bush! You can purchase the album for $6 here at our Bandcamp website, and also listen to all of the tracks before purchasing: Download the Audiobook/Album here now!